2 Spread rice in the bottom of a 9x13 inch baking dish. 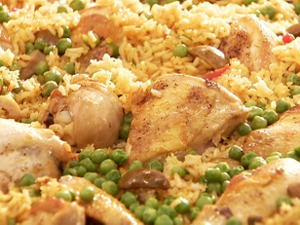 3 Rinse chicken and arrange chicken pieces on top of rice. 4 Mix soup and water together and pour over chicken and rice. 5 Sprinkle dry onion soup mix on top. 6 Cover and seal TIGHTLY with foil. 7 Bake in the preheated oven for 1 to 1 1/2 hours. Enjoy! 1 Mix all ingredients together and pour into a greased 3-quart casserole dish. 2 Bake for 20 to 25 minutes or until bubbly.